January | 2012 | Receiving. HPI: 52 year old male presents to the ED with four weeks of SOB and right sided chest pain. His symptoms have gradually progressed in severity and were worse with exertion. These symptoms started several days after he fell against a counter and struck his right chest wall. He initially had a “small gash and black and blue mark” on his right lateral chest wall but these resolved over the course of the month. He denied similar symptoms in the past. He denied any nausea or vomiting. He denied any orthopnea or PND symptoms. He did not take any medication for this. He complained of low grade fever. Review of systems is otherwise negative. PFH: Negative for DM, HTN, Ca. PSH: positive for tobacco use, negative for EtOH or illicit drugs. General: WNWD 52 year old male who appears to be tachypneic. Respiratory: Tachypnic, clear breath sounds on the left, but absent breath sounds on the right chest in all lung segments. MSK: chest wall was non-tender throughout palpation without any crepitance. Rest of the exam is unremarkable. Neurological: A&O X3, no obvious neurological deficits. A) What is your suspected diagnosis? B) A chest tube was placed and 1500 cc of yellow, exudative fluid was removed from the right chest cavity. Which of the following are consistent with exudative fluid? C) What is the most common cause of this condition? An empyema is a collection of exudate in the pleural cavity. It is most often caused by pleural extension of pneumonia, but it may be also caused by any seeding of the pleural cavity from penetrating trauma, esophageal rupture, previous thoracic surgery or previous chest tube placement. Empyema is also an under recognized complication of blunt thoracic trauma and may be an occult perpetrator in subsequent respiratory failure and need for mechanical ventilation. 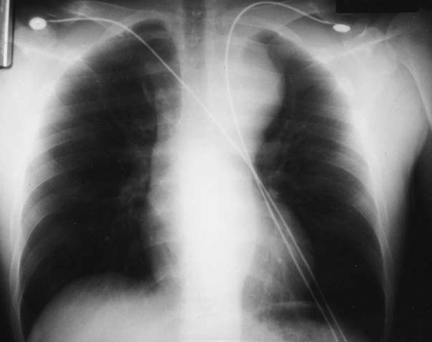 In the emergency setting, chest radiography is indicated to differentiate other chest pathology that can present similarly. A CT of the chest may be necessary to assess for underlying pneumonia, lung abscess, tumor, septations or other pleural disease. When 2-view chest radiographs are used to detect pleural fluid, the sensitivity is 67% and the specificity is 70%. Decubitus views increase the degree of confidence. However, decubitus views are often skipped, and the patient instead undergoes a CT examination. In the absence of trauma or surgery, the diagnosis of empyema would be very unlikely. Clinically, one might suspect empyema if the patient has fever, productive cough, or clinical symptoms consistent with pneumonia. Radiographically and without a known history, it would be difficult to differentiate the two entities. The gold standard for differentiating them is tube thoracostomy and evaluation of the fluid. The fluid obtained by tube thoracostomy is either exudate or transudate. Transudate is produced through pressure filtration without capillary injury while exudate is due to leakage from inflammatory cells. It is critical to identify the fluid as either exudate or transudate in order to make an accurate diagnosis. Light’s criteria, which compares chemistries of the fluid to blood is used to classify the fluid. Fluid is likely exudative if one of the following is true: the ratio of pleural fluid protein to serum protein is greater than 0.5, the ratio of pleural fluid LDH to serum LDH is greater than 0.6, the difference between albumin the fluid and albumin in the blood is less than 1.2 g/dL. Usually protein content of exudate is greater than 35 g/L and cholesterol content is greater than 45 mg/dL. The definitive management of empyema should be made in consultation with thoracic surgery and infectious disease. The gold standard of treatment has been prompt tube thoracostomy and intravenous antibiotics, but recent literature has suggested a benefit in both intrapleural fibrinolytics and early VATS. Pleural fluid should be sent for analysis and they should be admitted to the hospital for continued therapy. A 38 year old African American female presents to the ED with a chief complaint of shortness of breath. She began feeling ill 3 days ago with cough, myalgias, severe chills, fever and progressively worsening shortness of breath. This morning she coughed up some blood streaked sputum, which prompted her to come to the emergency department. The patient complains that her shortness of breath is associated with sharp, non-radiating midsternal chest tightness that is pleuritic in nature. She informs you that several of her co-workers are also feeling ill, with one admitted to the ICU yesterday with a diagnosis of pneumonia. The patient works at a coffee shop that you recall is located across the street from the local university’s newly constructed bioterrorism research lab. ROS: Positive for fevers, chills, myalgias, nausea, cough/hemoptysis, and shortness of breath. PMH: Hypertension. Denies CAD, CHF, COPD, cancer. Social Hx: Drinks alcohol rarely. Denies tobacco or illicit drug use. General appearance: Patient is ill-appearing, diaphoretic, and only able to speak in half-sentences because of dyspnea. Neck: Trachea midline. No nuchal rigidity, no jugular venous distension. Heart: S1 and S2 were heard. Tachycardic rate and regular rhythm. No murmurs or gallops. Lungs: Inspiratory rales and diminished breath sounds auscultated bilaterally. No wheezing. Abdomen: Soft, non-tender, no guarding. Neurologic: Alert and oriented with no motor or sensory deficits. EKG: Sinus tachycardia, 116 bpm. PR, QRS, QTc intervals normal. 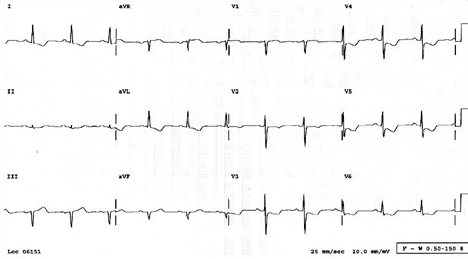 Normal axis, no LVH. No ST-T changes. The patient continues to develop worsening respiratory distress and eventually she is intubated in the ED for acute respiratory failure. As an astute ED physician, you think that there is a connection between this patient’s symptoms and the fact that she works across the street from a bioterrorism research facility, especially considering her reports of several sick coworkers. Though you are still considering more common diagnoses on your differential, you consider that this patient may have been exposed to a bioterrorism agent. 1) This patient’s history and clinical presentation is typical of inhalational exposure to which of the following possible bioterrorism agents? 2) You call the hospital laboratory and state that you are concerned that your patient may have been exposed to a biologic weapons agent. They send a blood sample to a state public health lab. In the meantime, you request that they perform a peripheral blood smear on one of the blood samples that you sent to their lab. They call you back in half an hour stating that the sample contained large gram positive bacilli. Having tentatively confirmed your diagnosis (from question 1), which of the following antibiotics should you initiate? 3) The patient was accompanied to the ED by one of her coworkers. You are worried that he may have been exposed to the same bioterrorism agent. He states that he generally feels fine, but he does have a skin lesion on his arm (see picture below). The patient states that this lesion is painless. This case mimics a real life incident where anthrax spores were accidentally vented from a bioweapons facility in the town of Sverdlovsk, in the former Soviet Union in 1979. This led to 77 cases of inhalational anthrax and many deaths, with many cases occurring in workers from a nearby factory. The appearance of multiple cases of previously healthy patients who develop a rapidly fulminant pneumonia should raise the suspicion for a bioterrorism incident. Inhalational anthrax has classically been described as following a two stage course. In the first stage, symptoms are nonspecific and often flu-like (e.g. fever, dyspnea, cough, headache, vomiting, chills, weakness, abdominal pain, and chest pain). This first stage can last from hours to days. The second stage is marked by abrupt onset of high fever, dyspnea, diaphoresis, and shock. 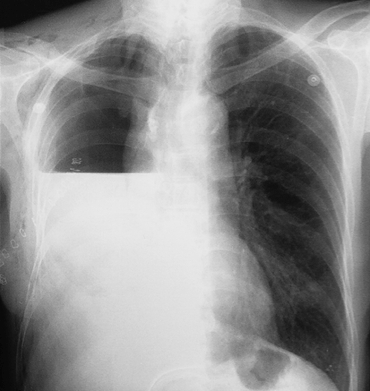 Chest x-ray will show multiple abnormalities, most classically a widened mediastinum, but also including infiltrates and a pleural effusion. CT Thorax will show enlarged hyperdense mediastinal and hilar lymph nodes. Cyanosis and hypotension eventually develop, and death follows soon. This second stage can occur within hours. Mortality rate is estimated at between 50 – 90% for inhalational anthrax. (Note: Pneumonic plague caused by Yersinia pestis can present very similarly to this case, with flu like symptoms progressing to respiratory failure, shock, and death within days. Pneumonic plague, unlike inhalational anthrax, can be transmitted from person to person). Ricin toxin inhalation would cause symptoms within hours of exposure, leading rapidly from flu like symptoms to respiratory distress and then shock and death. Inhaled aerosolized F. tularensis, or C. burnetii could both cause initial flu-like symptoms progressing to pneumonia, though the course in both of these diseases would be slower, milder and less likely to be fatal than inhalational anthrax (especially for C. burnetii infection). 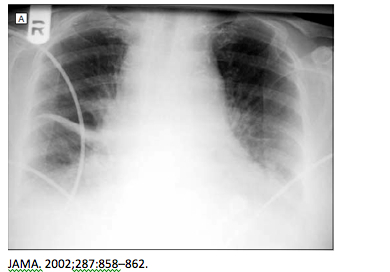 Neither ricin, tularemia, nor Q fever are associated with widened mediastinum on chest x-ray. Variola major infection (Smallpox), starts off with a flu-like prodrome and then produces a characteristic pustular rash and is not consistent with this patient’s clinical picture. Anthrax is described as a large, gram positive bacilli that can be seen on a blood smear or CSF stain later on in the disease course. Blood cultures should be drawn prior to antibiotic initiation, and will grow B. anthracis in 6-24 hours. The recommended initial IV therapy for inhalational anthrax is ciprofloxacin, 400 mg Q12 hours or alternately doxycycline 100mg Q12 hours. Naturally occurring B. anthracis have shown resistance to extended spectrum cephalosporins as well as TMP/SMX. This picture shows the characteristic painless black eschar of cutaneous anthrax. There were 11 cases of cutaneous anthrax following the 2001 anthrax mail attacks. Cutaneous anthrax starts as a pruritic macule or papule, progresses to ulcer and vesicles, and finally leads to a black painless eschar with local edema. Without treatment, cutaneous anthrax can progress to systemic disease with a mortality rate as high as 20%. The appropriate treatment is oral ciprofloxacin or doxycycline. Treatment does not alter the course of the eschar but does prevent the development of systemic disease. – Any case of inhalational anthrax should be regarded as a bioterrorism incident until proven otherwise. Suspicions of anthrax infection should be reported immediately to local or state public health departments. Natural anthrax infections – Natural cases of B. anthracis infection occur in herbivores that ingest the bacteria from the soil. Human infection occurs mainly from exposure to infected animals, historically in goat hair mill workers and leather tanners. No natural cases of inhalational anthrax have been reported in the U.S. since 1976 due to vaccination of livestock. Anthrax as a weapon – Multiple countries including the U.S., former Soviet Union, and Japan historically investigated the use of anthrax as a biological weapon. Unintentional release of anthrax from a Soviet bioweapons facility occurred in Sverdlovsk in the former Soviet Union in 1979 leading to many infections and deaths. The Aum Shinrikyo cult, known better for releasing sarin nerve gas in a Tokyo subway station in the 1990s, attempted to disperse anthrax spores through Tokyo multiple times, but were unsuccessful. In 2001, anthrax was used as a terror weapon through delivery of spores through U.S. mail to multiple locations, resulting in 22 anthrax cases, 11 cases of inhalational anthrax, and 5 deaths. Humans can develop cutaneous, inhalational, and gastrointestinal anthrax. In inhalational anthrax, spores are inhaled into the alveoli, where they are phagocytosed by macrophages and transported to the mediastinal lymph nodes. There, the spores hatch into vegetative cells, which release cytotoxic factors leading to cell death, edema, and ultimately mediastinal hemorrhage and bloody pleural effusions. In cutaneous anthrax, spores gain entry into the skin, often through abrasions or cuts. The spores hatch and again the vegetative cells release cytotoxins leading to cell necrosis. Gastrointestinal anthrax is mainly caused by ingestion of undercooked meat contaminated with vegetative B. anthracis, and is not generally associated with bioterrorism. Inhalational anthrax classically has been described as following a two stage course. In the first stage, symptoms are nonspecific and include fever, dyspnea, cough, headache, vomiting, chills, weakness, abdominal pain, and chest pain. This first stage can last from hours to days. The second stage is marked by abrupt onset of high fever, dyspnea, diaphoresis, and shock. 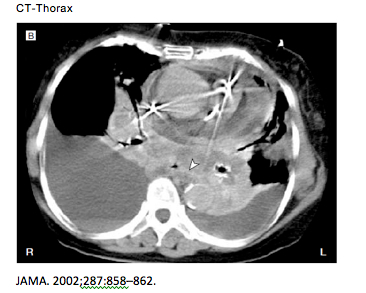 Mediastinal lymph node enlargement can be so severe that it leads to airway obstruction. Cyanosis and hypotension eventually develop, and death follows soon. This second stage can occur within hours. Cutaneous anthrax starts as a pruritic macule or papule, progresses to ulcer and vesicles, and finally leads to a black painless eschar with local edema. Without antibiotics, cutaneous anthrax can often lead to systemic disease with a mortality rate as high as 20%. General lab tests – May show leukocytosis, hemoconcentration, and/or elevated transaminases. Specific identification – B. anthracis cells appear as large gram positive bacilli. They can be seen in blood smears and in CSF. Blood cultures will grow B anthracis in all media in anywhere from 6 to 24 hours. Suspected anthrax should be confirmed by a local or state public health laboratory. Suspicion or confirmation of inhalational anthrax should lead to immediate notification of the local or state public health department, local or hospital epidemiologist, and local or state public health laboratories. It is important to treat suspected cases of inhalational anthrax even before there is laboratory confirmation. It is also important to draw cultures before antibiotics are initiated. 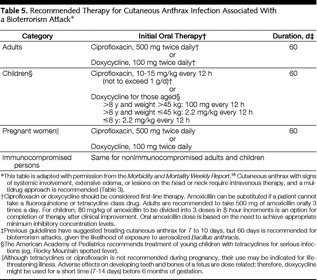 The following tables show recommended treatments for inhalational anthrax in a contained casualty situation, as well as the treatment regimen for cutaneous anthrax. Inglesby TV, O’Toole T, Henderson DA, Bartlett JG, Ascher MS, Eitzen E, et al. Anthrax as a biological weapon 2002: updated recommendations for management. Jama. 2002;287:2236–2252. “CDC | Bioterrorism Agents/Diseases (by Category) | Emergency Preparedness & Response.” CDC Emergency Preparedness & Response Site. Centers for Disease Control and Prevention. Web. 13 Jan. 2012. <http://www.bt.cdc.gov/agent/agentlist-category.asp&gt;. Mina B, Dym JP, Kuepper F, Tso R, Arrastia C, et al. Fatal inhalational anthrax with unknown source of exposure in a 61-year old woman in New York City. JAMA. 2002;287:858–862. HPI: 82 yo female was otherwise normal until 10am this morning when her family stated that she kind of passed out. She did not hit her head as she was sitting on the couch. When she came to she complained of tingling and numbness in her left arm and leg along with rather severe chest pain. She was brought in by EMS and they stated that she was in minor distress and sitting in a chair when they arrived on seen. She also complains of a sharp chest pain she describes as below the sternum that was worse when it first started but is more mild but constant now. She has been eating and drinking without issues, and has been feeling just fine previously. She denies any fevers or chills, nausea/vomiting/diarrhea, cough, or problems urinating. However she does provide that she has feels a little SOB since being picked up by EMS when asked. SH: Quit smoking 15 years ago. Denies drinking or elicit drug use. Lives at home with her husband. CV: Regular rate and rhythm, no murmurs noted. Upper ext pulses are 3+ and the lower ext pulses are 2+. EXT: 5+ strength in both upper and lower extremities. HENT: Normal cephalic, no facial droop or asymmetry noted. What subjective finding helps most in delineating MI from the above diagnosis? Roughly what percentage of patients with this diagnosis are initially confused for MI or something else upon initial presentation? Aortic dissection is a great imitator. There are several physical exam findings is this case that help guide you toward the diagnosis. First, she is hypertensive which is a common finding and also cause of a dissection. The hypertension is related to a combination of the underlying factors that led to the dissection, a resulting catecholamine surge and/or the false lumen compressing and narrowing the true lumen. The narrowing, for all intent and purposes, “stenosis” the true lumen increasing the overall pressure proximal to the involved portion of the aorta. It’s important to note that dissections can also present with hypotension which should make you think tamponade, rupture or MI from involvement of the coronaries if the diagnosis of dissection is being considered. The narrowing also causes the difference in peripheral pulses which makes sense. I like to kind of think of it as being similar to a coarctation where the blood pressure is less distally to the dissection making it less easily palpated in the lower extremities. Next, the wide pulse pressure is likely due to the tear extending into the aortic valve resulting in aortic regurgitation. Remember she previously had a valve replaced? Valve replacement can help precipitate the dissection. The CXR shows widening of the mediastinum. An estimated 62 percent of patients with a dissection have a widened mediastinum. However, nearly 12% are read as normal. As far as the subjective findings, the patient “passed out.” 5% of patients with aortic dissection will experience a syncopal episode. She also states that she is short of breath which can be a result of the dissection compressing a main stem bronchus. Other symptoms to look for include dysphagia from the esophagus being compressed, flank pain from renal artery involvement in the dissection, and of course stomach pain from a descending dissection occluding a mesentery vessel. Dissection can look like an MI. The classical substernal ripping/tearing sensation that radiates to the back is not always the case. In fact, 10% of patients with dissection present with no pain at all, while others present with more mild symptoms that look like musculosketal pain. As far as MI vs dissection, they both can cause substernal chest pain (aortic root) and both can even radiate into the neck or jaw (aortic arch). In addition to all this, dissections into the cardiac vessels can an STEMI with elevated troponins. So, the fact that the pain is more severe at onset is a clue that the patient is likely dissecting. This subjective finding was highlighted by several sources as being a focal finding during initial presentation that should clue us in that dissection needs to be considered. Roughly what percentage of patients with this diagnosis is initially confused for MI or something else upon initial presentation? MI and musculoskeletal pain are not the only contributors to the confusion. In fact, 38% dissections are missed upon initial presentation. 20% of dissections have neurological manifestations which can make you think stroke. Patients can present with hemiparesis, hemianesthesia or weakness. If the cervical ganglion is affect, dissection patients can present with Horner’s syndrome. If that was not enough, peripheral nerve ischemia may manifest with numbness and tingling, pain, or weakness in the extremities. The bottom-line is to keep dissection in your differential when working up chest pain as it has a very high morbidity and mortality and has a high probability of being initially missed. HPI: Patient is a 49 yo male who states he fell off a ladder about 3 feet. He believes he landed on his left side, mostly on the left elbow and left side of his body and back. He states that his head hit last and he did not sustain any loss of consciousness and has no acute headache. He is complaining of acute pain in the left elbow. He states he looked at his back and noticed a swelling and is having pain there as well. He drove himself here to the hospital and currently is standing at the side of the bed complaining of pain in the left lower back, left elbow, and left flank pain. The pain in the back has not radiated. It stays on the left side near the swelling and is described as a sharp pinching movement that is deep inside. He states movement makes it worse. Nothing makes it better. Rates it an 8/10. CONSTITUTIONAL: No fevers, chills or weakness. CARDIOVASCULAR: Some left-sided upper back, chest pain. RESPIRATORY: Some pain with deep breaths on the left. No shortness of breath. GENITOURINARY: No hematuria. Positive left flank pain. SKIN: Positive laceration over the left elbow. MUSCULOSKELETAL: Left lower lumbar pain, left rib pain. Left elbow pain. NEUROLOGIC: No loss of consciousness, numbness, tingling or weakness. SOCIAL HISTORY: Denies alcohol, tobacco, and illicit drug abuse. The patient works as a UPS driver and deliveryman. VITAL SIGNS: On arrival 161/89 with pulse 64, respirations 16, temperature 36.6 and pulse oximetry is 98% on room air, which is within normal limits. GENERAL: This is a 49-year-old, well-nourished, well-developed, well-hydrated male standing at the side of an ER cart in mild to moderate distress. PSYCHIATRIC: Awake, alert, and cooperative, with normal memory, mood and judgment. EYES: Reveal no conjunctiva injection. No scleral icterus. ENT: His oropharynx is clear with moist mucous membranes. CARDIOVASCULAR: Heart has a regular rate and rhythm. There is no S3, S4. RESPIRATORY: Normal respiratory effort. He has equal and clear breath sounds bilaterally. No rales, rhonchi or wheezes. No obvious splinting. GI: His abdomen is soft, nontender. There is no rebound, rigidity or guarding. SKIN: Warm and dry. There is a laceration and abrasion over the left elbow. There is a contusion over L1. No other obvious sites of bruising or injury. No further abrasions or lacerations. MUSCULOSKELETAL: He has some tenderness over the superior SI joint on the left and over the paraspinal musculature of the lumbar area. He has contusion and swelling over L1 but no acute tenderness to palpation in this area. He has some tenderness over the left posterior ribs profusely. There is no point tenderness. Extends from the midaxillary to the midscapular line. He has no tenderness over the C-spine or T-spine. Examination of the right upper extremity, left lower and right lower extremity shows no gross abnormalities or tenderness to palpation. The pelvis is nontender. The left upper extremity reveals a 2-cm laceration over the elbow. However, he has full range of motion of the elbow. No acute bony tenderness to palpation is noted up and down the left upper extremity. 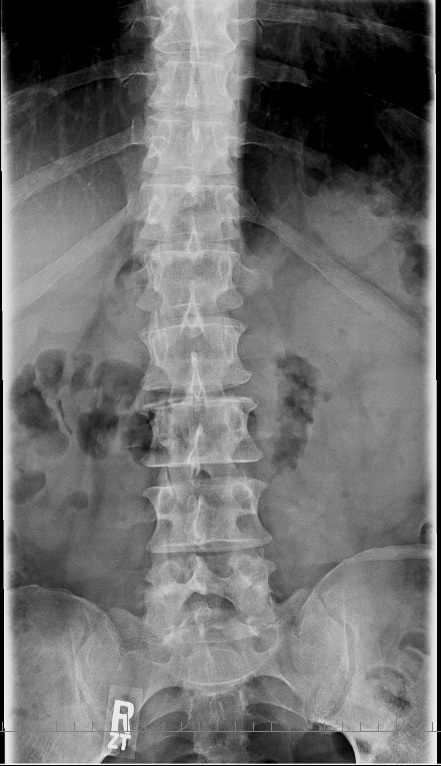 1) What abnormality is seen in the radiologic study seen above? 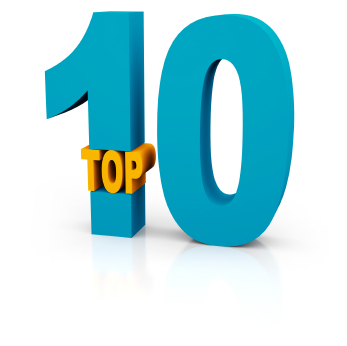 2) Based on the radiologic study, what laboratory study must be ordered to rule out an important associated injury? 1) Transverse Process fractures put the patient at risk for ureteral injuries. Ureteral injuries due to external trauma are rare. It composes less than 1% of all genitourinary injuries caused by external trauma. The ureter is well protected by the bony pelvis, psoas muscle and vertebrae. If the ureter is damaged, it is generally due to a significant trauma with associated injuries to other abdominal organs. The presentation and management is generally dictated by the severity of associated injuries. Penetrating trauma is more likely the cause of ureteral injury than blunt trauma accounting for 91%. Ureteral injuries associated with blunt trauma generally occur at the pelviureter junction. With blunt trauma the mechanism of injury is generally hyperextension with overstretching or compression of the ureter against the transverse process of the lumbar spine. 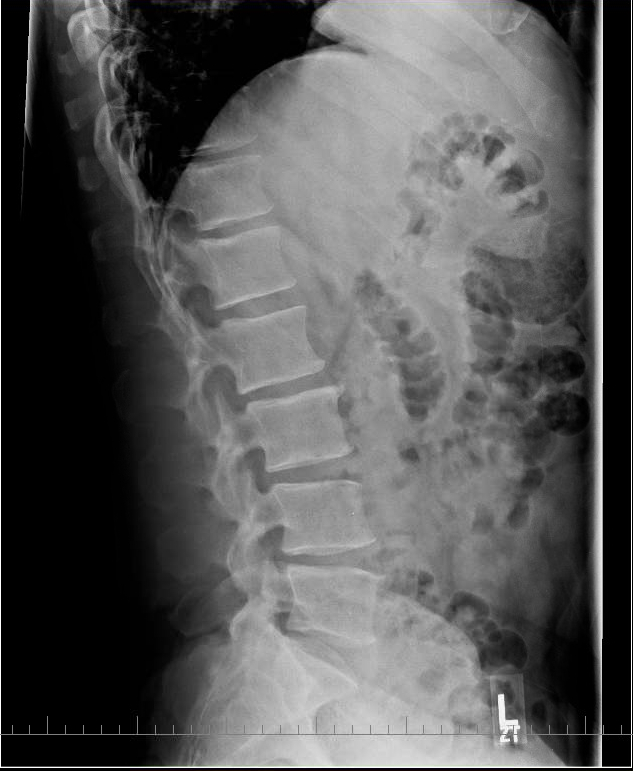 These injuries generally result from high speed MVCs, a fall from a significant height, or a direct blow to L2-L3 region In this case, the transverse processes were actually fractured off the vertebral body, increasing the risk of penetrating ureteral injury. Penetrating ureteral injuries generally occur in the upper portion greater than the distal portion, although this is generally due to penetrating trauma from a projectile or stab wound. Ureteral injuries can range from a simple contusion to partial tear to full transection. 2) In patients with external trauma a high level of suspicion must be maintained. The diagnostic laboratory test of choice to assess for ureteral injury is a urinalysis. This is to assess for microscopic hematuria or gross hematuria. There is controversy related to the evaluation of ureteral injuries, by means of urinalysis. Hematuria is found in 74% of cases (either gross or microscopic.) Failure to see hematuria may be due to complete transection of the ureter or partial transection of an adynamic segment. There have been studies that show absent hematuria in patients with penetrating trauma, but operatively found to have disruption of the ureter (Brandes et al.) This has made the evaluation of ureteral trauma with urinalysis not completely reliable. 3) CT is the most reliable means to diagnosis an ureteral injury in blunt trauma with a stable patient. If the clinician has a high index of suspicion for ureteral injury, a CT scan should be performed with images in the excretory phase to visualize the opacified collecting system and ureters. This means having delayed imaging of at least 10-15 minutes after contrast injection in order to see urine extravasation. The integrity of the ureter can be determined whether iodinated urine is present in the ureter below the level of the injury. If it is this may be indicative of a partial disruption or contusion. This type of injury, particularly a partial tear, may be repaired by ureteral stenting versus a laparotomy. Intravenous pyleograms maybe considered if a patient is unstable and unable to be taken to the CT scanner. IVP’s can be done in the operating room, but there have been documented cases where IVP has failed to diagnosis a ureteral injury, making this an unreliable test as well. Findings that suggest an injury include delayed renal function or excretion, ureteral dilatation or deviation, extravasation of contrast or non-visualization of the ureter.